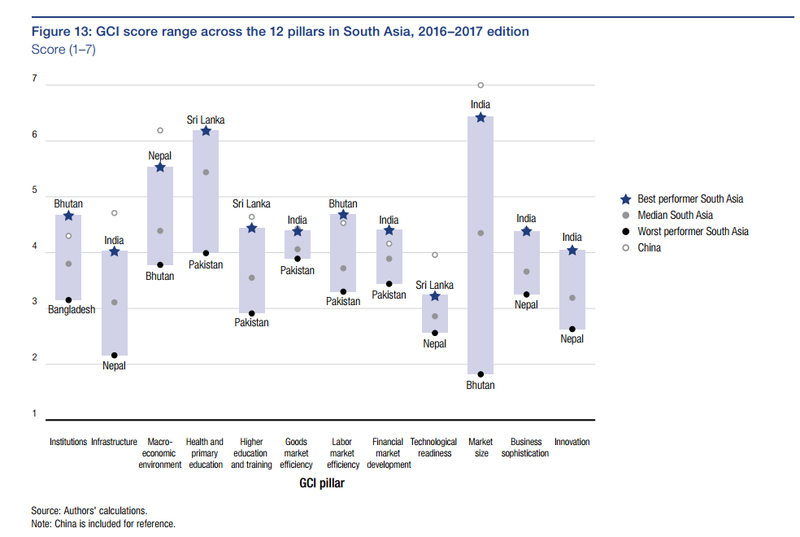 Health and primary education and infrastructure have improved significantly in South Asia since 2007, but the latter remains the region’s second weakest pillar, just after technological readiness. Investment in these areas will be vital to fully unlock economic growth. 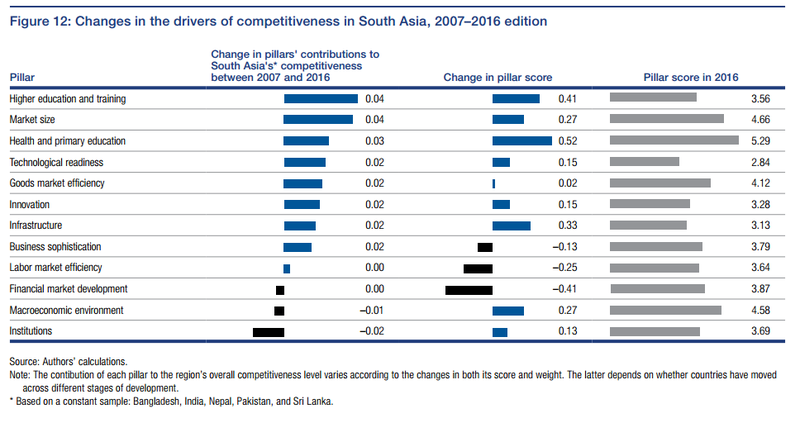 As they move up the development ladder, it will also be increasingly important for South Asian economies to establish competitiveness agendas to improve the functioning of their labour and financial markets, which have deteriorated over the last 10 years. The region remains diverse, with a core of three heavyweight economies - India, Pakistan, and Bangladesh - surrounded by smaller ones such as Bhutan, Nepal, and Sri Lanka, each with its own peculiarities and unique development path (see chart below). Since 2007, the gap between the best- and worst-performing economies in the region has increased in some of the drivers of competitiveness, mostly as a result of the deteriorating situation in Pakistan. The quality of infrastructure improves significantly (although from low levels) in India, Bangladesh, and Sri Lanka, while it stalls in Nepal and deteriorates in Pakistan. Pakistan is also the only economy that fails to improve its macroeconomic environment and health and primary education levels, falling behind other South Asian economies. Financial market development remains poor across the entire region, as does technological readiness; this last area improves significantly only in Bangladesh and Sri Lanka, which overtook India to become the best performer in this pillar in the region. India leads the group of South Asian economies, climbing for the second year in a row, to 39th. Its competitiveness has improved across the board, in particular in goods market efficiency, business sophistication, and innovation. Thanks to improved monetary and fiscal policies, as well as lower oil prices, the Indian economy has stabilized and now has the highest growth among G20 countries. Recent reform efforts have concentrated on improving public institutions (up 16), opening the economy to foreign investors and international trade (up four), and increasing transparency in the financial system (up 15). Still, a lot needs to be done. The labour market is segmented between workers protected by rigid regulations and centralized wage determination (112nd), especially in the manufacturing sector, and millions of unprotected and informal workers. The efficiency of the domestic market (81st) is hindered by fiscal regulations that allow federal states to levy different levels of value-added taxes; large, publicly owned enterprises further reduce the overall efficiency of the economy, especially in the utilities sector and the financial market, where there is growing concern about the incidence of non-performing loans. Finally, lack of infrastructure (68th) and ICT use (120th) remain bottlenecks. Improvement has been slow in recent years and further investment will be necessary, especially to connect rural areas and make sure they can equally benefit from and contribute to the country’s development. The richest economy in the region, Sri Lanka, slips three places to 71st, but has a stable score. Over the past 10 years, the country experienced tumultuous development and today needs to concentrate on those areas that are most important to trigger the efficiencies that will drive further growth: restructuring the labor market and investing in technological readiness, where it lags significantly behind countries at a similar stage of development. Macroeconomic conditions improved slightly, but continue to be fragile, as high government deficit and debt led to a precautionary agreement with the IMF early this year. Education remains Sri Lanka’s main strength: in addition to high levels of health and primary education (37th), the island reaps the benefits of early investments in higher education and training, today a comparative advantage vis-à-vis its peers and, since 2009, best performing country in the region. The two Himalayan economies, Bhutan (97th) and Nepal (98th), both improve their positions this year, by eight places and one place, respectively. Infrastructure and connectivity are bottlenecks for both economies but, thanks to heavy investments in hydroelectric power, Bhutan can rely on a high-quality electricity supply (41st). Nepal boasts the best macroeconomic environment in the region and, after significant recent improvement, the second highest level of health and primary education. With a stable score, Bangladesh climbs one position to 106th. Over the last decade, the country improved the level of basic education and health of its workforce, but consolidating the institutional framework and investing in the development of infrastructure will be key to placing growth onto solid foundations. Better levels of higher education and ICT readiness will be necessary to upgrade the manufacturing sector and the overall level of sophistication of the economy. Pakistan completes the group of South Asian economies. Its upward trend of recent years continues with an advance of four places to 122nd, although its score is still below the 2007 level. The climate of instability during this period has surely weighed down the country’s economic development.